Not knowing the slightest thing about diving in general, I was reliably informed by Liz that Falmouth is renowned throughout the UK as one of the in places to dive. I’m guessing that might be down to our clear Atlantic waters and the huge maritime history connected to Falmouth. Wrecks galore, oh and the marine life too…. So, Silver Steps in Falmouth was the location where Liz and I met. Liz’s love of diving started in 2013 after going on holiday to Thailand. She soon fell in love with the underwater world and was persuaded to change her 3 week holiday to a 6 month trip. She secured a job working as a snorkel guide and began to build up her diving experience steadily. 5 years forward and 5 countries later, she’s returned to Cornwall and she’s now a Master Scuba Diver Trainer Instructor - Thats her official title. The morning we met, she rocked up with a group of like minded individuals, soon to be divers themselves and a van load of kit. And I mean a van load of kit! I was astonished by the sheer amount she’d brought with her. Not only that, the weight of it all. I guess if you attach a lot of weight to yourself then sinking comes naturally. The sinking element of diving is of course well controlled and professionally calculated. It was very obvious to me from the start that safety on these dives was paramount. The number of checks Liz went through, not only on other divers, but her own kit was endless. I got lost, again, on the technical aspects of diving as Liz explained some of the equipment to me. Not one of the divers went into the water unless their kits were checked and checked again. Instructions from Liz to the divers that morning with regards to how the dive was going to unfold was extremely professional and precise. She really does know her stuff! 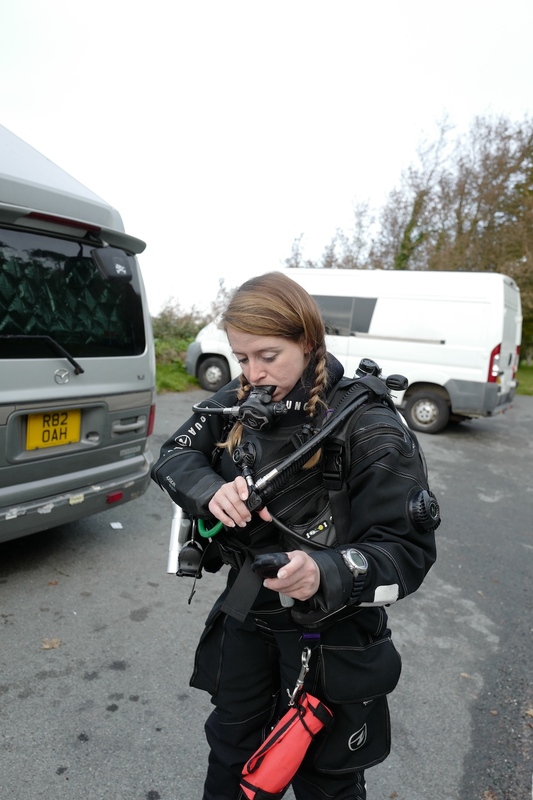 Liz now manages a local dive centre which takes up a large proportion of her time. Being outside and underwater is where she belongs.